For the THE GARDEN OF EDEN, "Code Magazine 2.0" will come in residency to the Palais de Tokyo to low-print in situ and time-based publications. 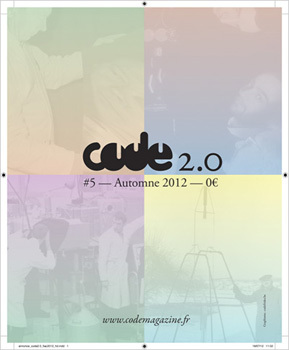 Several times during the exhibition, "Code Magazine 2.0" will realize a special issue dedicated to the exhibition and the events program. Thanks to our crew of writers, artists, photographers, etc, and a good ammount of templates and collective patterns, we will published low-tech bricolage and Fluxus-kind magazines. Writers will review the events, photographers grasp the red carpet. At the end of each presence, a magazine will be edited and distributed. At the end of the exhibition, the different issues will be bound together to act as one possible memory of the show. "Code Magazine 2.0" is a free contemporary art magazine dedicated to young artists and writers published in Paris twice a year. The next issue will be published during FIAC 2012. It aims at introducing new forms of expression as well as to raise the interest of the public for an exciting and innovating culture. Each issue contains artists monographs, thematic papers, commissioned visual essays and portfolio, etc. It is distributed in France and Belgium, and in several locations in Switzerland and Germany. Clément Dirié & Laetitia Chauvin are the editors-in-chief of "Code Magazine 2.0". Dirié is an art historian and critic, curator and the French editor of JRP|Ringier. Chauvin is an art critic and curator, currently working for the Institut français, Paris.